The deposits, which have been steadily rising since March 2017, were at Rs 80,545.70 crore on April 11, 2018, said a finance ministry data. Pradhan Mantri Jan-Dhan Yojana (PMJDY) accounts had come into focus during the demonetisation period when the deposits witnessed a meteoric rise. The latest report of the World Bank titled Global Findex Report, 2017 released last week cited the success of the Jan Dhan Yojana. India's financial inclusion efforts have won recognition from the World Bank as their data indicate that 55 per cent of new bank accounts opened are from India, Financial Services Secretary Rajiv Kumar had said. The deposits increased in the later part of November 2016 to over Rs 74,000 crore from about Rs 45,300 in the beginning of the month as people rushed to deposit the scrapped currency notes of Rs 500 and Rs 1,000, as per the government data. Thereafter, deposits in the accounts dipped before picking up again in a steady manner from March 2017. It increased to Rs 73,878.73 crore in December 2017 , to Rs 75,572 crore in February 2018 and further to Rs 78,494 crore last month. The number of people joining the financial inclusion programme too is on rise. The number of account holders increased to 31.45 crore on April 11, 2018 from 26.5 crore at the beginning of 2017. As per the data, the number of such account holders was 25.51 crore on November 9, 2016, the day demonetisation came into effect. Director-Business Services of AISECT Abhishek Pandit said the impact of note ban on Jan Dhan accounts can be gauged from the fact that "the average deposits in such accounts operating through our banking kiosks stood at Rs 480 per account before demonetisation, which increased to Rs 1,095 per account after that". AISECT has set up over 1,400 banking kiosks across rural and semi-urban India to promote financial inclusion. 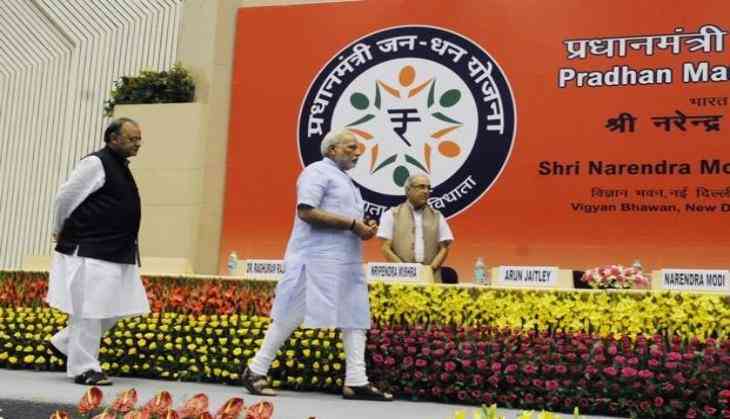 Launched in August 2014, PMJDY is a national mission for financial inclusion to ensure access to financial services - banking/ savings & deposit accounts, remittance, credit, insurance, pension. As per the Global Findex Report, adult bank account holders in India increased to 80 per cent in 2017 as compared to 53 per cent in 2014 and 35 per cent in 2011, Kumar had said. Women at the forefront, he said, highlights a sharp fall in gender gap from 20 per cent in 2014 to 6 per cent in 2017 in bank accounts due to government's efforts. The report noted the rapid increase in financial inclusion that has taken place in India and how the number of account holders in the country has risen from 35 per cent of the adults in 2011 and 53 per cent in 2014 to 80 per cent in 2017.